This handy and versatile detector can be used not only for the detection of listening devices but also wireless cameras and illicit mobile phones, that are for example used by unauthorised persons like in prisons etc. The transmitted field strength is indicated on a display as well as by a pitching tone. The nearer you approach to the object you wish to locate, not only the indicated field strength but also the tone pitch increases. Sound alarm of course can be switched off in cases where sounds must be avoided, as for example during sweeping of a room where active transmitters might be in operation. 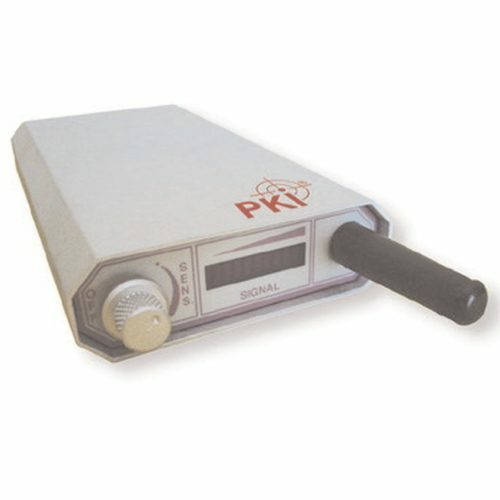 The sensitivity of reception is especially high within the frequency range of mobile phones and wireless video transmitters, i.e. between 0,9 and 5,8 GHz.